Sometimes Auction Watch is incredibly difficult to write; lots of terrible auctions with almost nothing that speaks to me. This week is one of the rare weeks that I need to arbitrarily reign myself in. I could have easily added several auctions. 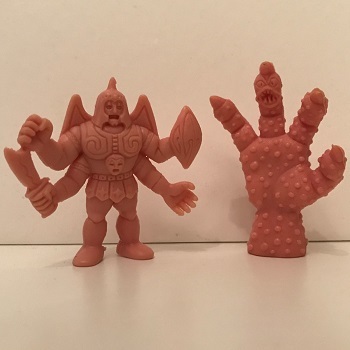 The first auction, 2 Rare Mattel M.U.S.C.L.E Men – 236 & 153: Satan’s Cross and The Claw, was an auction that made me pause and think. The auction has a $74 BIN and potential buyers are unable to make an offer. My first reaction was to mock the price as outrageous, but is it? Personally I don’t believe that Satan Cross is worth $50. I’ve offered my opinion on Satan Cross’ price, but I’ve also taken a pragmatic look at the price too. If Satan Cross has a $50 price tag (and people are overpaying for even Flesh #153), then is a $74 BIN worth thinking about? Again, personally, I don’t think it is – but Satan Cross has never been about logic. An impatient collector could likely rationalize $60 for Satan Cross. That means the buyer is purchasing a $14 flesh figure too. That seems very difficult to justify. But is the impatient collector is willing to pay $70 for a Satan Cross? It’s possible. That would mean the buyer is now purchasing a $4 flesh figure too. Not outrageous if they are willing to spend $70 on Satan Cross. I’m very curious to see if this pair of figures is sold. Very curious. 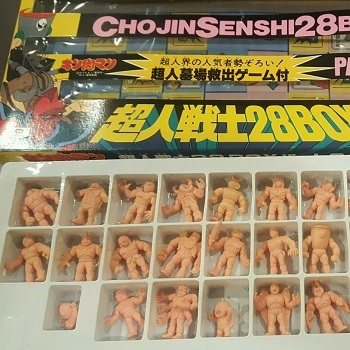 The second auction, Kinnikuman kinkeshi 28 pack Part 8 m.u.s.c.l.e., feels like an auction from the early days of M.U.S.C.L.E. collecting. The opening bid of $9.99, for this auction, seems like a gateway drug to full-blown Kinnikuman collecting. I am not Kinnikuman expert, maybe this is an utterly boring and mundane item. 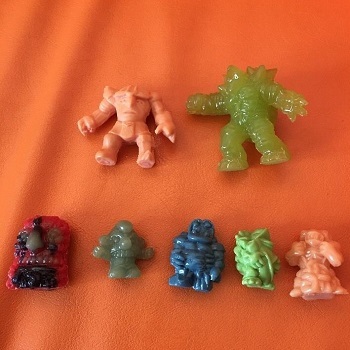 When I see a 28-pack from the original release of figures, with two Non-M.U.S.C.L.E. sculpts, I have to admit I’m curious. The opening bid of $9.99 keeps my interest. Too many sellers of M.U.S.C.L.E. items think the collecting population is large enough to demand a premium (and more often outrageous) price. It is not. It never has been. I hope M.U.S.C.L.E. collectors get more opportunities like this one. In a shocking moment of optimism, I believe M.U.S.C.L.E. collectors will because it feels like many M.U.S.C.L.E. collectors are streamlining their collections. The outrageous opening bids most often come from uninformed sellers. True M.U.S.C.L.E. fans know that a fair opening bid (or lower) helps maximize their return. The third auction, M.U.S.C.L.E. Scale Custom Rubber Keshi Ironhaus Starter Pack, is shocking to me. I never completed my Hell Turtle review, but I love the figure and have mentioned in several times mentioned in several times on the site. I believe the $19.99 opening bid is worth it for the Hell Turtle alone. Adding in all of the other figures is a bonus – which is not meant to minimize or take anything away from the other figures. I believe Hell Turtle is simply one of the best modern minifigures. It as an absolute must own for any minifigure collector. Rarely do I admit I’m going to be bidding on an auction. But I will be bidding on this auction. In fact, I won the last auction from this seller featuring IRONHAUS figures. The fourth auction, Kinnikuman custom vinyl figure Primus Frizzle Cheese pop icon rock album toy wow, extinguished the excitement I was feeling from the previous auction. This auction caused me instant confusion. Is this a “pre-order” for a figure? A figure that isn’t even clearly shown to potential buyers? 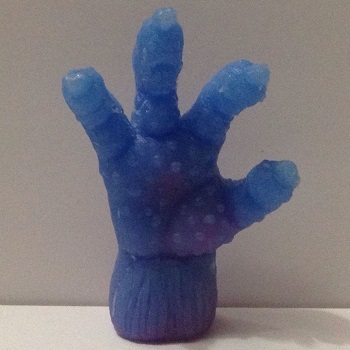 If anyone has information about this figure or seller, then please post in the Comments below. I’d love to know more about it. Because right now I hate everything about it. Thankfully my frustration with the fourth auction was quickly erased. The fifth auction, M.u.s.c.l.e. Men Figure Claw Wolf Voight, was the auction responsible for erasing that frustration. Seeing a custom Wolf Voigt figure being sold with a starting bid of $0.01 is life affirming for me. It fills me with hope. Only two auctions ago I was praising a lot of custom figures with a $19.99 opening bid. It may sound contradictory to say I think all custom lots should start at $0.99 or less. The truth is, I’m not wed to an absolute price. I do believe that far too often custom figures are given premium prices for all the wrong reasons. Sellers place a premium price on an item that created its own “exclusivity.” I hate fake exclusivity. Too many buyers love to buy something “exclusive” and too many sellers are willing to indulge that urge. 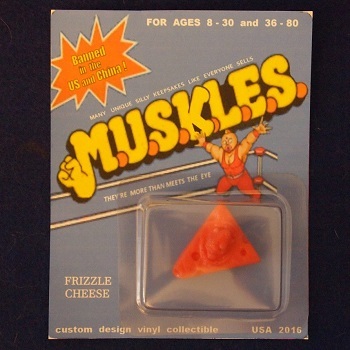 Over the years I’ve noticed that the best custom M.U.S.C.L.E. figures and M.U.S.C.L.E.-inspired minifigures are usually always available. Certain colors may not be revisited, but if a figure is strong enough that never matters. I could go on and on – maybe that is a rant for another time. This entry was posted on Thursday, October 13th, 2016 and is filed under Auction Watch, UofM News. You can follow any responses to this entry through RSS 2.0. You can skip to the end and leave a response. Pinging is currently not allowed.